How many should I plant? By Harriet Palmer and David Bergin, November 2017. Totara (Podocarpus totara) is one of New Zealand’s most easily grown native species. It has an extensive natural range and tolerates a wide variety of sites. It readily regenerates from seed, and if established with care, planted seedlings have very good survival rates. On the right site both planted and naturally regenerated totara can be managed to produce single, straight stems with good potential for timber. The timber itself is easy to work, versatile, and the heartwood is highly durable. Ensure livestock are fenced out before planting. Control browsing pests – e.g. deer, goats, hares and rabbits – and ensure numbers are kept low. Use good quality seedlings – both bare- rooted and containerised totara stock is fine as long as the seedlings are sturdy, with a good root:shoot ratio. Check that containerised stock is not pot-bound. Handle seedlings carefully, keep cool and moist, and plant as soon as possible after they arrive from the nursery, especially if bare-rooted. Prepare grass sites with spot spraying before planting. Control competing vegetation around each seedling by careful knapsack spraying (seek advice on choice of chemical). Repeat release spraying over several years with totara and other native species, as they are slow to establish and will readily succumb to competition by surrounding vegetation in the first few years after planting. Totara will grow on a wide range of sites. The exception is wet sites, where species such as kahikatea are a better choice. Totara will grow best on well-sheltered sites with free-draining soils, but it can survive on dry, stony, and exposed sites. It grows well in open sites (without shade), and can be established in gaps in regenerating scrub. If planted (or naturally regenerating) under a canopy, it will survive but only grow slowly and in dense shade it will eventually die. The more densely trees are planted, the more likely they are to grow tall and straight with good timber potential. In theory tightly spaced trees need relatively little pruning or intervention other than thinning. A reasonable planting rate for totara on an open site is around 2 metres apart (2500 stems per hectare); at this planting density thinning will likely be needed 10 – 20 years later depending on survival and growth. An alternative to planting only totara is to plant a cover of (possibly cheaper) nurse species (e.g. pittosporums, coprosmas, kanuka, manuka) at 1.5 – 2 metre spacing (higher planting density is recommended on particularly weedy sites to help suppress weed growth), and then inter-plant with totara at around 4 metre spacing (600 – 800 stems per hectare). Generally aim for a mixture of around 80% nurse species to 20% inter-planted totara which, on all but the most exposed sites, can all be planted at the same time. If the aim is to produce straight single stems suitable for milling, form-pruning is recommended. Form pruning involves pruning from ‘the top down’, by selecting a leading stem and removing any likely competing leaders and any steep-angled or particularly coarse branches. Pruning can begin once the trees are well-established and above the height of any competing vegetation – e.g. from around 2 metres tall. Pruning trials by the Northland Totara Working Group (NTWG) have aimed to retain at least 30% of the green crown, so in other words trees can be pruned quite hard. Suitable tools include normal loppers, long-handled loppers, and a pruning hand-saw. The smaller more horizontal branches on lower stems of totara established within a stand will generally self-prune following canopy closure, so there may be little need for clearwood pruning. Where trees are open-grown or have retained large branches following canopy closure, stems of selected final crop trees can be clear-pruned to whatever height required. 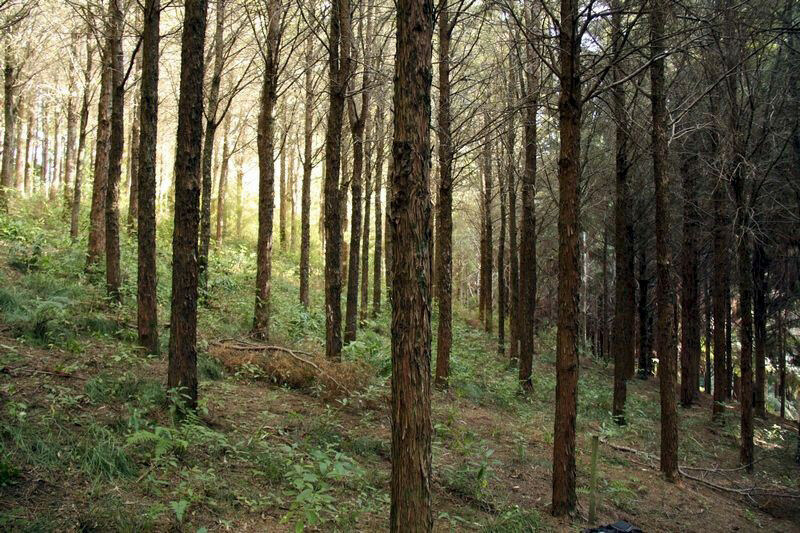 If densely planted stands are left-unthinned, the result will be a stand of slow-growing tall, thin trees with good form but small- diameter stems, limiting their potential for sawmilling. In theory thinning allows remaining stems to increase their diameter faster. Research by the NTWG on naturally regenerating totara on farmland indicates that totara does respond positively to thinning. stands with a mean tree diameter of 30 cm benefit from thinning to less than 500 stems per ha (minimum of around 5 metre spacing). In other words owners of planted stands may want to factor in at least two thinning operations. A Tane’s Tree Trust survey of indigenous plantations indicates a mean stem diameter of 30 cm at 60 years for totara planted across a range of sites with mixed management histories. However, on good sites and with good management, totara can average 50 cm diameter by age 60. As with other native conifers in New Zealand, totara heartwood is slow to develop. Nevertheless there are many opportunities to use the timber from relatively fast growing 50 – 100 year old plantations and from managed naturally regenerating stands. Tane’s Tree Trust and the Northland Totara Working Group are leading several projects evaluating and promoting sustainable management of totara from these stands for a wide range of uses including carving, furniture, joinery and building. Totara: establishment, growth and management. David Bergin. NZ Indigenous Tree Bulletin No.1 (2003), Scion, Rotorua, N.Z. Management of naturally regenerated totara on farms: thinning and pruning. Tane’s Tree Trust Technical Article 11.3, Tanes Tree Trust, N.Z.